Yesterday, Today, and Tomorrow (Italian: Ieri, oggi, domani) is a 1963 comedy anthology film by Italian director Vittorio de Sica. 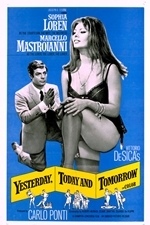 It stars Sophia Loren and Marcello Mastroianni. The film consists of three short stories about couples in different parts of Italy. The film won the Academy Award for Best Foreign Language Film at the 37th Academy Awards.